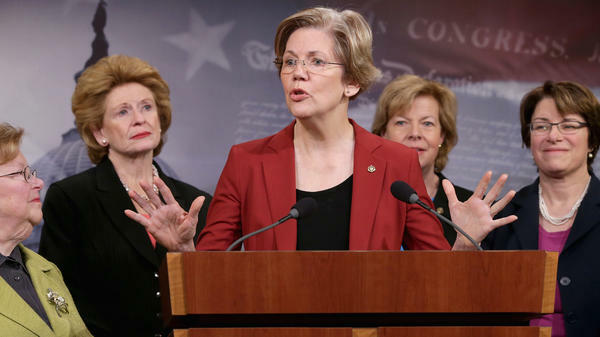 Former U.S. Sen. Barabara Mikulski (D-MD), U.S. Sen. Debbie Stabenow (D-MI), U.S. Sen. Elizabeth Warren (D-MA), U.S. Sen. Tammy Baldwin (D-WI) and U.S. Sen. Amy Klobuchar (D-MN) join other women Democratic senators for a news conference at the U.S. Capitol January 30, 2014. New data from the Pew Research Center shows that Republican and Republican-leaning women are roughly twice as likely (44 percent) as Republican men (24 percent) to say that there are too few women in office, and are also significantly more likely to say that it's easier for men to get into office. They also differ on the reasons for that — 64 percent of GOP women say women have to do more to prove themselves, more than twice the rate of GOP men (28 percent). 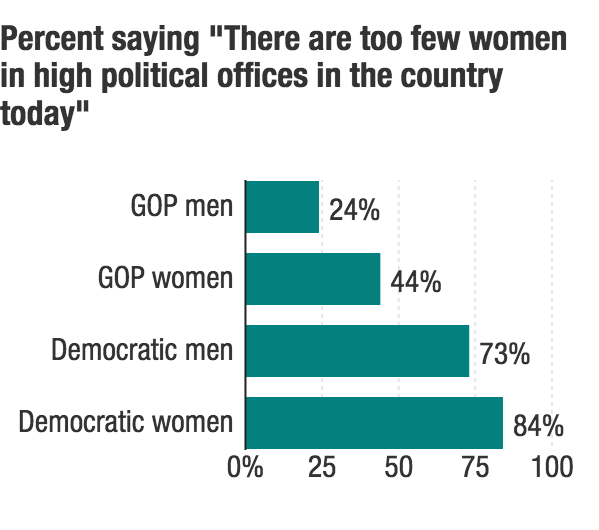 In addition, nearly half of GOP women say discrimination keeps women out of office — three times the rate of GOP men (14 percent). On both of those questions, Republican men stand apart from the rest of the nation. 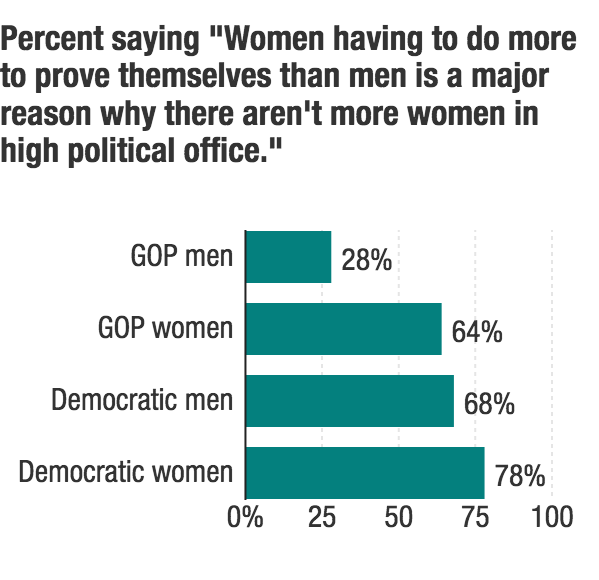 Majorities of Republican women, Democratic women, and Democratic men say that women have to do more to prove themselves, compared to that 28 percent of GOP men. 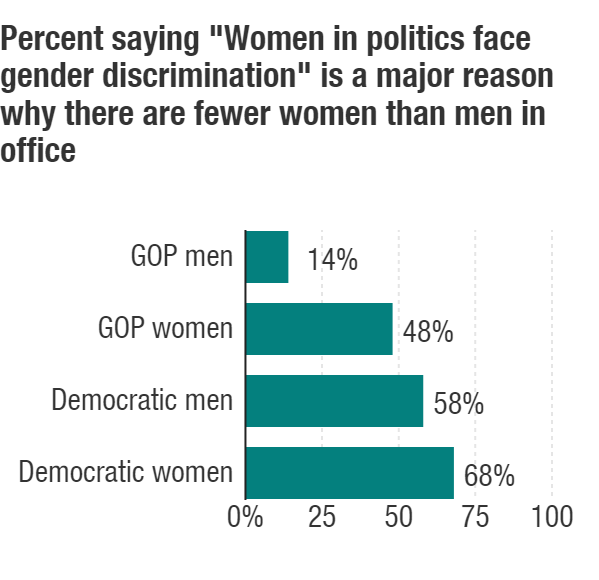 Likewise, while nearly half of GOP women and majorities of Democrats believe discrimination keeps women from office, compared to that 14 percent of GOP men. Republican women are also significantly more likely than men in their party to say that sexual harassment, differences in party support, and voters "not being ready" to elect women keep women out of office. Democrats also have some gender gaps, but they are neither as numerous nor as wide, for the most part, as on the GOP side. Among the largest: 42 percent of Democratic men, compared to 63 percent of Democratic women, say a key factor is that girls aren't encouraged as boys to aim for office. And like Republican men, Democratic men are significantly less likely than their female counterparts to believe that Americans "aren't ready to elect a woman to higher office." The results are particularly illuminating in a year in which women candidates have broken records — but the overwhelming bulk of that energy is on the Democratic side. Donald Trump's election win and Hillary Clinton's loss together made many Democratic women decide to run. Meanwhile, Republican women's numbers have lagged their Democratic counterparts. These latest poll numbers suggest that Republican men and women differ not only on why their party has not elected more women, but also on how necessary that would be. The poll also shows that Americans see women and men as having different abilities on both leadership and policy. A slight majority — 57 percent — see women and men's leadership styles as different. Among those, a majority (62 percent) don't see either as better. Among those who do think one gender is better, there are substantial party differences — Republicans are more likely to give men the edge, and Democrats say the same of women. This is one more area where Republican men and women diverge. Among Republican men who see a difference, 32 percent say men's leadership style is better. Only 6 percent say the same of women. Republican women, meanwhile, are more evenly split — 15 percent say women, 18 percent say men. Democratic men and women aren't as divided, according to the Pew report. People also generally thought that men and women don't differ in their leadership traits. But among those who did, they often thought women in office better embodied those skills than men. Of the nine that Pew asked about, there was only one trait — being compassionate and empathetic — where most people saw a difference between women and men...and the majority of those who saw a difference (61 percent) said women in office are better on that trait than men. Only 5 percent gave men the edge. Across the other eight traits, a majority saw no difference between men and women. Still, across five of those — including honesty, ability to compromise, and being civil — those who did see a difference were much more likely to say women were better. On only one trait — willingness to take risks — did they say men were better. The fact that some voters think so highly of women candidates could be good news for the record-breaking number of women running for office this year, and by extension Democrats since most of them are running in that party. Then again, people don't necessarily vote for the candidate they think is going to be the best leader. Plenty vote by party, on a single issue, simply choose the incumbent, or decide based on any number of other reasons. The poll was conducted from June 19 through July 2, among nearly 4600 adults, who were recruited by phone but did the poll online. The margin of error for the full sample is plus or minus 2.4 percentage points (though margins are larger for the subgroups mentioned here).